Hi there - this will be my last post for a while, I'll be focusing on traditional holiday celebrations over the next week or so. 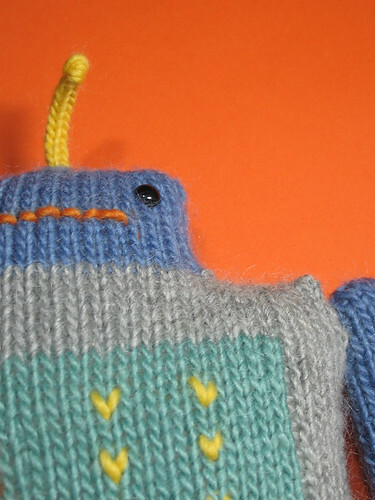 Here's a robot I knitted - my first in a really long time - for the Kim Family Benefit Auction, organized by sisters Lisa Congdon and Stephanie Barnes and their mom Gerrie Congdon. Here's the direct link to the post about my dude. He'll be put up for auction along with a whole lot of other amazing stuff on January 3, 2007. Whoa, 2007? Aren't we supposed to be living on the moon by now? Anyway, happiest of holidaze to you all, and to all a good night. And a glorious crafty 2007, too. to you too! got your card yesterday. i love it. it's my favorite one on my mantle (bookshelf). Hi! you have such a nice blog!! i really like your works! and by the way, happy holidays!